SEXUAL HARASSMENT and SEXUAL ASSAULT are terrible events. Training in these areas is essential. However, for bar or club security workers, the correct training is ESSENTIAL. Here is a true story related to the lack of this ESSENTIAL training. I received a call from a client about an injury that occurred to one of their security guards while they were walking out a combative female guest. As the owner told me the story of how the injury occurred, I listened and mentally analyzed the incident… as I do to all of these types of phone call stories. As the owner talked, I evaluated the why and the possible solution to help my other clients prevent a similar injury. Additionally, as I listened to the story, I realized he was touching on an increasing problem seen across the country in bars and clubs. This problem is that females are absolutely becoming more violent and our male guards are afraid to go hands on to stop the female violent acts. Oh, by the way, the injury, just so you know, is commonly called a “Fish hook”. Some of you immediately know what I mean. For those that don’t know, this very painful and potentially life changing injury, occurs when the female guest, while holding her stiletto heels, swings them at the security guard, as a weapon. The “Fish hook” occurs when the long, slender portion of the heel catches the victim guard in the soft tissue of the cheek and penetrates into the mouth… therefore, “Fish hook” injury. In this particular incident, and in TOO MANY OTHER similar incidents, the answer to “Why” was first, she was allowed to become over-intoxicated while at the club. The second part of “Why” was that the 3 security guards involved were genuinely afraid to put their hands on her as they walked her out. YES, I said the security guards were afraid to put their hands on a violent guest, a violent female guest. Again, for those of you that are actually in the hospitality industry, you probably know why the guards were worried. For those of you who may have never even thought about this…. Please allow me to explain this multilevel problem. The guards were worried about two things as they were considering putting their hands on this violent female; ONE, they were afraid of being accused of Sexual Harassment and, TWO, being afraid of being accused of Sexual Assault. Right off the bat let me tell you that NEITHER truly apply to the bar or club security guard while doing their job correctly. Let me further explain this issue in detail… hopefully, as you read this, you have an open mind and carefully consider my explanation. Also, I’m not an attorney and if you doubt my explanation, please go pay for an attorney to tell you I’m right. Here are the primary historic reasons “male” guards are afraid to truly grab and handle a violent “female”. GUARDS ARE TYPICALLY MALE – Most hospitality security guards or bouncers are male.Females can do the job but 99% of “bouncers” are men. Boys should be nice to girls. Females are soft, tender and cry easy. Girl trips and falls and dad says; “oh, baby, my princess, let me see that boo boo, let daddy kiss it and make it better… as he gently wipes away the tears”. These are just SOME of the commonly taught gender bias stereotypes, there are many others. And, yes, I know that there are some strong and independent women that were taught to be tough by their male or female role model. This outline fit’s nearly 90% of the male population. In addition to those gender stereotype mistakes, boys and young men are also commonly told and taught; “Don’t raise your voice to your mother” and “You don’t hit your sister” and “Boys don’t hit girls”. These aren’t bad training points for a young man… but, the message carry’s on. INADEQUATE JOB TRAINING – Sexual Harassment and Sexual Assault training and understanding these issues are an important part of creating a comfortable and successful work environment. I am a complete advocate of this type of training and actually think it needs more emphasis. However, the hospitality industry is a very unique animal in respects to how we teach Sexual Harassment and Sexual Assault Prevention to our employees, especially our male employees. What I’ve seen that is missing, is a discussion on what Sexual Harassment and Sexual Assault IS NOT. Teaching what these things ARE NOTcan truly help the predominately male work pool understand the issue, while also lowering incidents of assault on guards by females, lowering overall premise liability and reducing negligence claims. Remember, what I’m training and writing about is simple. A guest is not an employee and the common term of Sexual Harassment and Sexual Assault do not apply from a male employee towards a guest. What this means should be fairly simple to understand. A guard continues to ask a guest for their phone number. The guard continues and now tries to get a date with the same female guest. As the female guest leaves the venue, the guard follows the guest outside to continue to try to get their phone number and a date. This activity by the guard is not illegal and again, is not Sexual Harassment as the law outlines. However, as I stated in the last scenario, it is a rude, inappropriate and possibly intimidating behavior by the guard and they should be terminated for their actions. Now let’s step up the pressure and discuss an actual fight. A female is fighting with another female guest. The security guard radios for back up as they move in to grab the arms of one of the fighting females. He pulls her arms behind her back, holds her against a wall, for a moment, calms her down and then walks her out with another guard while continuing to hold her arms behind her back. Now, ask yourself; “Was there any employer or employee position of power in this interaction related to workplace harassment?” The answer is no. This should be easy to understand, no matter what others yell out or insist, the “Sexual Harassment” in the headlines surrounds workplace power. In my scenario, the guard was doing their job in the best way for this situation. Failure to step in to grab the arms of the female would open the bar to increased liability for failing to take reasonable steps to limit injury or violence. Next, let’s talk about Sexual Assault. Law enforcement agents in every city should know their state statutes and often times will know, from memory, what types of crimes are; “Specific Intent Crimes”. Sexual Assault is considered a “Specific Intent Crime”. What that phrase basically means is that the suspect involved in the Sexual Assault, must have certain “Specific Intent” to commit that crime before or as they actually commit the crime. The law enforcement agent can discover the “Specific Intent” by the suspect as they gather information from the victim, witnesses or suspect, from the actual actions of the suspect and even from any in house video of the incident. In addition to the Specific Intent, a Sexual Assault crime must have certain actions that must also occur to actually be a Sexual Assault crime. Although these actions differ slightly from state to state, the basic premise of the crime are the same. The suspect must have intentionally touched the intimate parts of another with the intent to cause or gain sexual arousal. Again, this phrase may read different in other states but it is very similar. SO, now consider our prior fighting female scenario … she is fighting with another female. Our guard radios for back up, moves in and grabs the arms of the fighting female. He pulls her arms behind her, holds her against a wall, calms her down and then walks her outside with a partner and both hold her arms. Now, ask yourself; “What was the guards intent at the very moment he grabbed the fighting female?” You should be able to easily see the intent of the guard was to stop the fight and prevent any further injury. It is really that simple. Security Guards or Bouncers are hired for the main purpose of keeping guests, employees and property safe. They seek out problems, react to problems and attempt to solve problems to reduce the properties civil liability exposure. This is a very difficult job if the proper training is not provided. 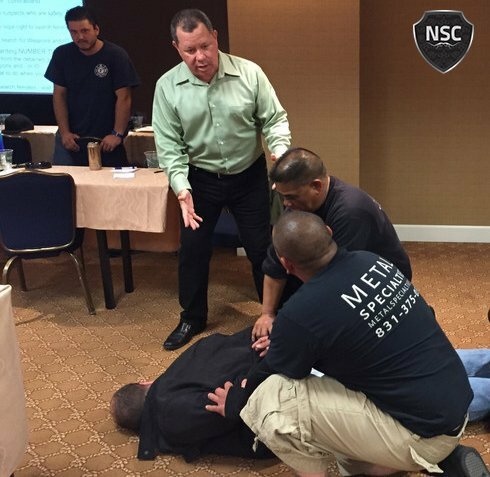 The three simple training scenarios I provided actually occur nearly every weekend across our country in bars or clubs. Females are getting more empowered and are becoming more physically violent. They are defending themselves more often, they are reacting to anyone putting hands on them and our team members must be trained to understand this. Now, let’s go back to the opening paragraph about the call from my client and my quick analysis. Ask yourself, if the security guards had reacted to the combative female guest by putting their hands on her correctly, by securing her hands, is it more than likely that our injury would have been prevented? I’ve been teaching and training on this topic for many years and I still find resistance from operators, managers and guards. I understand the resistance, it’s all from the Gender Bias training nearly all men have received for hundreds of years. I tell these resistant operators that two training goals I have is to keep their guard from getting arrested and to keep their bar or club from getting sued. I am also very aware of the fear from owners or managers who worry about the perception and the complaints from this fighting female guest and their friends. I ask that owner or manager to weigh the risk versus reward… meaning, what is the potential cost of not breaking up the fight correctly and quickly versus trying to simply stand in between and using our body as shields. I don’t think the risk of complaints match the insurance losses from not breaking up the fight. Understanding that the current news discussions on Sexual Harassment and Sexual Assault are important but it’s also important for owners and managers to teach their team that one of their primary jobs is to prevent injury to guests, employees and even to themselves. Understanding what Sexual Harassment and Sexual Assault is AND what they are not can absolutely prevent injury to guests, employees and to the actual guards.